If you are the driving force behind a new house build, no matter how skilled you are, you will almost certainly need to enlist the help of others along the way. From specialist electricians to hired hands who will help you get on top of the most labour-intensive parts of the process, it will be impossible to do everything on your own. However, when it comes to using specialist machinery, you may not have to hire in individuals to operate the likes of diggers and forklifts, and instead could find that sourcing your own and learning to operate them makes the job easier, cheaper and more focussed. After all, there are many variables on a building site that those new to the self-build world may not be aware of. From workers being delayed on others jobs, and in turn being unable to be with you when they say they will, to extreme weather conditions that mean you have to pay for workers to sit inside doing nothing, there will be many instances when best-laid-plans will very much go awry. However, by giving yourself the tools and skills to carry out more of the tasks without help, you could save money and simultaneously ensure that work is always carried out on the most suitable day rather than seeing schedules constantly having to be altered. The majority of those building their first property are unlikely to have a fleet of diggers or forklifts at their disposal. As such, the first thing to do will be to find out where to get such vehicles from. In the case of diggers, it is likely that hiring such vehicles makes the most sense, not only because they will often only be needed at the start of projects, but also due to the fact that quality diggers are far harder to find on the second hand market. In the case of forklifts, on the other hand, it may be extremely easy to pick up used trucks from specialist companies such as Trucks Direct based in Birmingham, for a surprisingly low price. As such, you can have a vehicle on site as and when you need it without having to pay every single time unforeseen circumstances crop up. Once the project is finished, you may then be able to sell on the very same vehicle, having spent only a very small amount of money in the process and finding that you were far more productive and far better off as a result. Find out more about buying second-hand forklift trucks on the Trucks Direct Website. Before using such vehicles, you will of course need to ensure that you are trained to safely operate them. From how they actually work to how to keep yourself completely safe when operating them, there will be a great deal to understand before you start the engine. However, courses will not take long and will be very cost-effective, ensuring that you can be up and running in no time at all and without such considerations taking a significant chunk out of your budget. There will be online courses that can be taken in your own time to better prepare you for your training, allowing you to make the process even more time- and cost-effective. 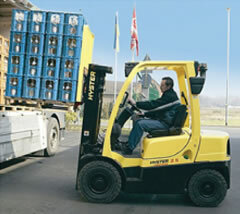 Find out more about forklift training courses at the Fork Lift Truck Association website. Sourcing your own vehicles and taking courses to train you in their safe use will allow you far more flexibility on your building site, reducing downtime and the associated costs and giving you greater opportunity to carry out work in the most appropriate way. By sourcing used forklifts and renting the likes of diggers as-and-when you need them, you may be able to take on an even bigger role when managing your site and ensure that your chances of success don’t have to be placed into the hands of others. Read more about Building Projects and Practices in DIY Doctor’s self-build section.